Old map by BRITISH ADMIRALTY CHART. - Africa south east Algoa Bay by Lieut Joseph Dayman RN assisted by Lieut HG Simpson RN 1855. Title: Africa south east Algoa Bay by Lieut Joseph Dayman RN assisted by Lieut HG Simpson RN 1855. Size: 24.4 x 38.8 inches. A fine Hydrographic Office chart no. 642 (2191), showing the coast of Algoa Bay with Port Elisabeth and Cape Recife. With three coastal profiles, a lighthouse and one inset : " Bird Islands surveyed by Mr F Skead Master RN assisted by Mr MP Auret 1856 1:24,000".Engraved by J. & C. Walker. London : Published at the Admiralty 20th October 1856 under the Superintendence of Captn. Washington R.N. F.R.S. 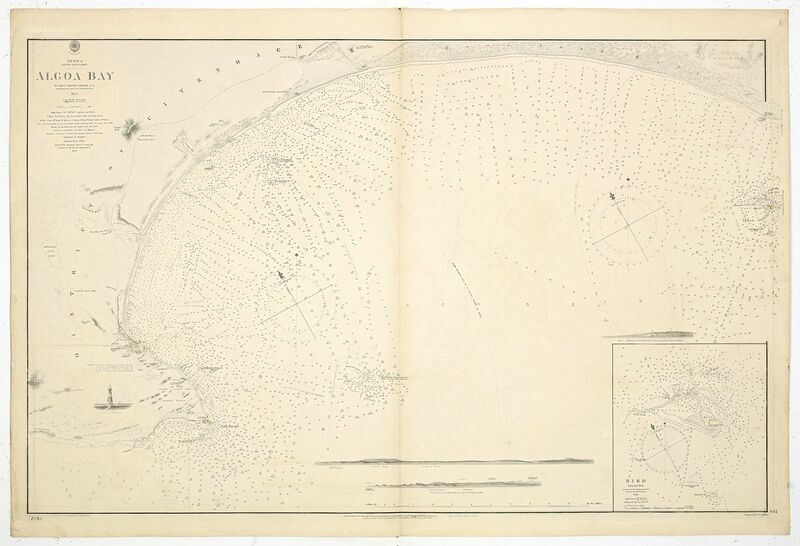 Hydrographer : Sold by J.D. Potter agent for the Admiralty charts, 31 Poultry & 11 King Street, Tower Hill.